Troy, MI., August 3, 2015 – Altair together with the Center for Automotive Research (CAR) has announced Ford Motor Company as the winner of the 3rd annual Altair Enlighten Award for its use of various lightweight materials to minimize weight of the 2015 Ford F-150. 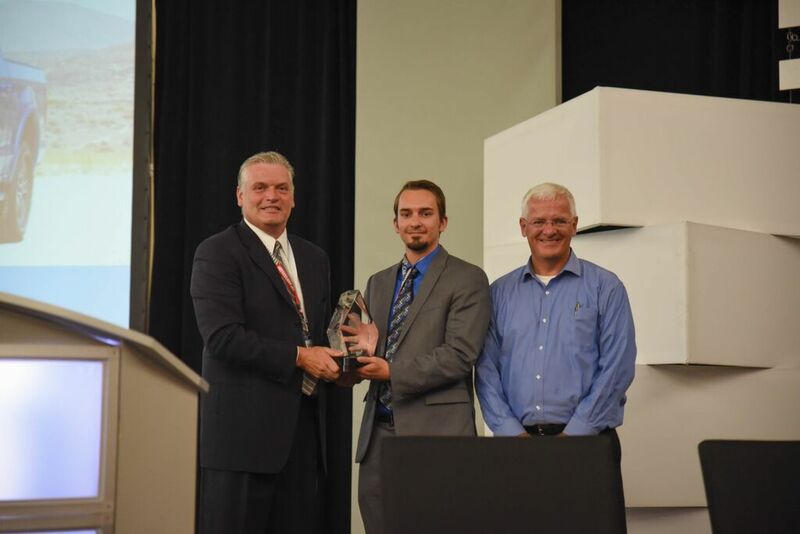 The award was presented today during the 2015 CAR Management Briefing Seminars (MBS) in Traverse City, Mich. The Enlighten Award is the automotive industry’s first award program created specifically to acknowledge innovation in vehicle weight reduction. Ford’s entry, one of 17 nominations that competed for the award, was selected as the winner for taking 700 pounds (318 kg) off of the Ford F-150 while improving its performance, safety, and efficiency. Ford engineers took a holistic approach to weight reduction by incorporating advanced materials into the entire design of the vehicle, including the frame, body, powertrain, battery and interior features such as the seats. The weight savings help the truck tow more, haul more, accelerate quicker and stop shorter, and it contributes to fuel efficiency. High-strength, military-grade, aluminum alloys were used throughout the F-150 for the first time, saving approximately 400 pounds (181 kg) from the vehicle’s body. Ford’s engineering, research and manufacturing teams overcame the challenge of shifting from the traditional steel body to the advanced aluminum production. This is a noteworthy example of taking aluminum to a high volume application. Additionally, Ford increased use of high-strength steel from 23 percent to 78 percent. By doing so, it increased the stiffness of the frame while reducing the weight by as much as 60 pounds (27 kg). The 2015 F-150 established a new standard for full-size pickups by bringing together improved capability and efficiency, along with cutting-edge smart vehicle technology. This year’s first runner-up is General Motors, who developed and used innovative computer-aided engineering (CAE) methods to achieve a 163 pounds (74 kg) weight reduction on the Alpha architecture of the 2012 Cadillac ATS/CTS. Immersive lattice topology optimization, strategic structural bulkhead placement, and multi-disciplinary loadcase optimization, were used, along with expert interpretation of the results, to lead the design of the architecture structure. The Alpha architecture’s delivers mass efficiency, stiffness, safety, structural feel, and has improved fuel economy without degrading on-road performance characteristics. Second runner-up was awarded to Faurecia together with Automotive Performance Materials (APM). The NAFILean (Natural Fibers for Lean Injection Design) solution brought sustainable design to instrument panels, center consoles and door panels of the 2013 Peugeot 308 by integrating a natural, hemp-based fiber with polypropylene, which allows for complex shapes and architectures along with a weight savings of 20-25 percent. The purpose of www.altairenlighten.com is to provide a global knowledge source for useful, informative and inspirational content focused on minimizing the weight of products across industries through innovative design techniques, materials technology and manufacturing processes; improving industry best practices to respond to the challenges of mass management and meeting fuel economy targets, government and competitive; and addressing increasing vehicle safety requirements. The Center for Automotive Research is a non-profit organization based in Ann Arbor, Mich. Its mission is to conduct research on significant issues related to the future direction of the global automotive industry, organize and conduct forums of value to the automotive community, and foster industry relationships. For more information, visit the CAR website: www.cargroup.org.